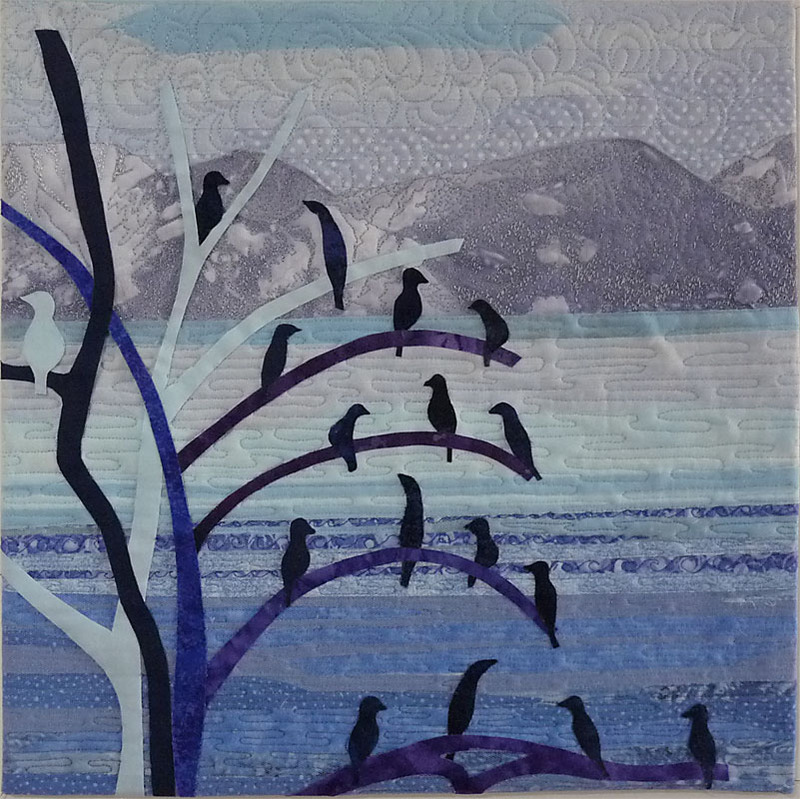 The inspiration for this piece was a photograph of a flock of cormorants on a tree in a lake. I liked the way they all seemed to be talking to each other as if they had gathered for a meeting. This made me imagine a conference meeting where it seemed that there would always be someone that wouldn’t agree hence Odd One Out. The piece has been created using strips of fabric on a foundation to create the background which has been overlaid with tulle, the key elements have then been fused to the surface and the whole piece has been heavily free motion quilted. I chose a blue analogous colour scheme because the original photo was all blues and greys and these are colours I find very difficult to work with thus forcing me to work outside my comfort zone (which are the warm colours). I used a combination of hand dyes and commercial fabrics from my stash. 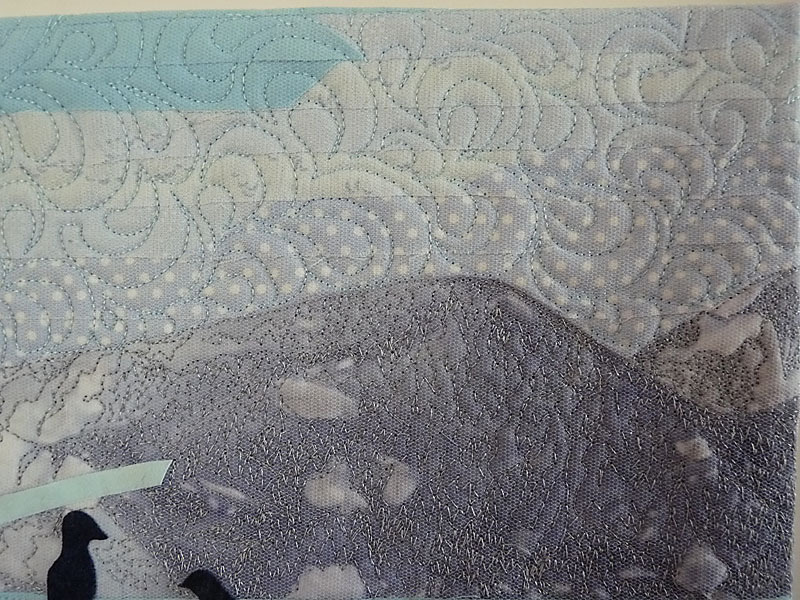 The fabric used for the mountains were a hand dye done specifically for the project that turned out to be just perfect when I layered up my background. 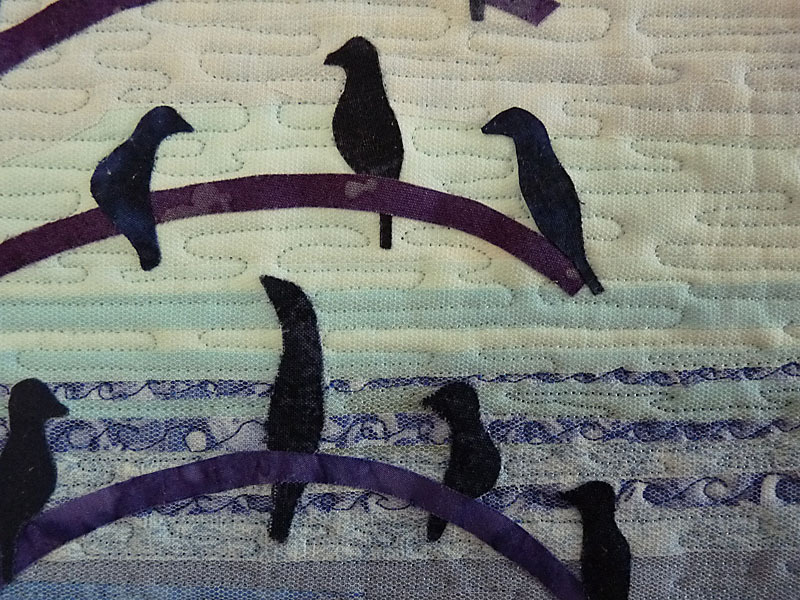 My thanks to Elizabeth Barton whose course “Inspired to Design” I used as a means to create my design and whose tips and advice were most welcome during this process. Although I had not intended to create a pictorial design I am pleased with the results. Gaye, I had the opportunity to see your quilt because I took the same EB class with you. So I am thrilled to see the finished quilt. While I did not use her class to come up with my idea for this particular quilt, I did manage to get some ideas for future much larger quilts. Fantastic job on your quilt. When I saw that you were going to do birds, I decided not to do birds for my theme!